Tesla plunged after disappointing Model 3 deliveries and an across-the-lineup price cut prompted concerns that the carmaker may bump up against a ceiling for demand. The 63 150 Model 3s Tesla handed over to customers in the fourth quarter trailed the roughly 63 700 average analyst estimate. The company announced a $2 000 price cut on each of its vehicles to help make up for US buyers now being eligible for only a $3 750 federal tax credit for the next six months, half what they were getting previously. Tesla shares fell as much as 9.7% to $300.52 as of 9:36 am on Wednesday in New York. The stock advanced 6.9% last year while most other automakers slumped. Whereas Tesla began 2018 with production being the big challenge, chief executive officer Elon Musk is starting this year with worries about how much of a market is left for pricier versions of the Model 3. The company said more than three quarters of Model 3 orders in the last three months of the year were from new customers, rather than reservation holders, suggesting many consumers are still waiting to buy versions of the sedan at the long-promised $35 000 sticker price. 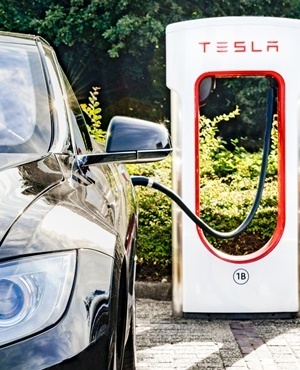 "This was a good quarter in terms of production ramp and strong underlying demand, but Tesla came up shy of bull expectations and this will be the focus of the street," Daniel Ives, an analyst at Wedbush Securities, said in an email. "We also believe the $2 000 price cut to help subsidise the lower EV tax credit is a move that was not fully expected." It will be a few more weeks before Tesla confirms whether it was profitable for a second consecutive quarter, but the company’s ability to sustain a high level of production - it built 61 394 Model 3s and 86 555 vehicles total in the last three months - will go a long way toward that goal. Musk now plans to turn attention to filling Model 3 orders in Europe and China starting in February, which could help offset some of the potential drop in US demand linked to the shrinking tax credit. Tesla fell just short of its target to deliver 100 000 of its more expensive Model S and Model X vehicles for the year, selling 99 394 units.